This is the first ever -crowdsourced- multi camera concert video registration, created from video footage recorded by the audience and published on the internet. 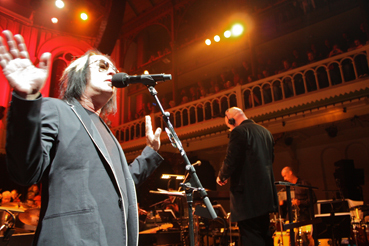 Todd Rundgren is a pioneer and has many music industry 'firsts' to his name. Here is another one, this time offered to him by his fans in the Netherlands. For the first time: a full 1 hour and 30 minutes multicam concert video registration, created from video footage recorded by the audience and published on the internet. Enjoy! The best opportunities in life are not planned, they just happen, right in front of you. You only have to see and act upon them. 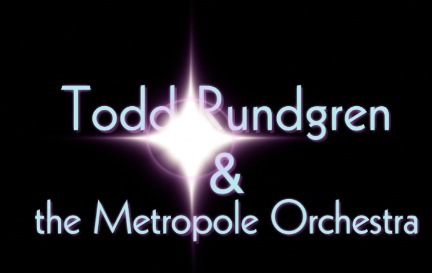 I never planned to record the Todd Rundgren & the Metropole Orchestra concert, I just ended up in front of the stage, 4 ft from Todd and ready to take a few pictures with my photo camera. But the lighting was difficult and after a while I decided to put down the camera and just enjoy this fabulous show. 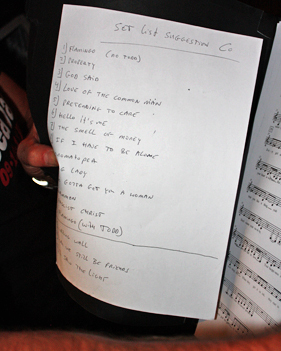 The 3rd song was 'Love Of The Common Man' and there - 17 minutes into the show - I pulled out my iPhone. Great closeup of Todd and conductor Steve Sidwell appearing on it's HD screen. I could even pick up the sound of his voice directly at times. I recorded 2 songs and then enjoyed Todd singing 'Hello It's me' and 'The Smell Of Money'. Around 36 minutes into the show, during the intro of 'If I Have To Be Alone' I pulled out the iPhone again as I suddenly realized the show would be recorded (multitrack) for radio and I could later replace the iPhone's mono sound with a proper stereo mix. From that moment on I tried to hold the iPhone as steady as I could (as we all know is almost impossible) and treat it like it was a real camera. This time I did not stop and kept it running until the end of the show. It was well worth it: the closeup HD footage turned out to be great and very unique. Later that week I discovered others had posted clips from the concert on YouTube, including clips of songs I did not record myself. As a TV director I started thinking: wouldn't it be great to use all this footage and do a multi-cam / multi-angle edit of the entire show... At the same time as a Todd fan I also realized the importance of having a video registration of this unique event. The orchestral arrangements of songs we know so well were simply stunning and sounded so beautiful that even Todd himself had to hold back a few tears at times. At times I felt a bit embarrassed, intruding Todd's space filming so close, for which I apologize. Like one time he had to cough right before the camera and he gave me a very clear "I-don't-want-to-see-this-on-YouTube" look afterwards. Don't worry Todd, it's solved. ;) But I also knew this show just had to be documented, for Todd, his fans, all involved and certainly for myself, even if much of the material consists of amateurish, often shaky footage. After all, HD video would still look better than most of the video stuff from the 70's and I knew the stereo radio mix would come out perfect. In filmschool we learn that in TV audio is 60% of the message, video being just 40%, almost like illustrations in a book. This goes especially for music video. But most important: this was an excellent show. I tried to contact those who had posted on YouTube to see if I could obtain their original footage. But most of them did not believe it could be done and did not cooperate. So I had to work with the internet material and loaded it into (Apple's) Final Cut Pro X that I was experimenting with at the time. This revolutionary new editing program could actually handle all these (6) different video formats in one project for the first time. My priority was covering all songs with video. Some SD footage was used where no HD was available. From 17 minutes into the show more HD material could be used for multi angle editing, enabling me to make better artistic editing choices as well. Sure, this is amateur footage - no one used tripods and amateurs never stop zooming. But the good news is: it still worked! Todd and the orchestras stunning performance itself and the great soundtrack compensate for what is missing. You will experience this unique show as if you where there, seen though the eyes of the audience. 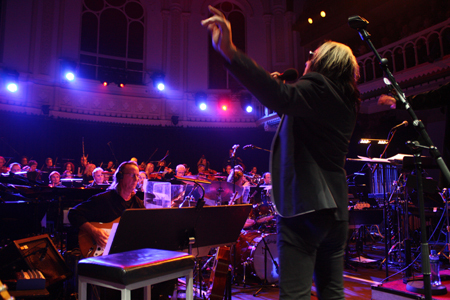 So here it is: complete coverage of the Amsterdam 'Todd & The Metropole Orchestra' concert. With pristine stereo audio from the guys at NTR radio. Don't be turned off by poor SD quality at the very beginning of the show. It gets (a lot) better later on as you'll be pleased to find out. Just hang in there and see Todd perform some of his greatest work with a full orchestra, wonderfully arranged by the talented Tom Trapp.